In my humble opinion this double, in phase, mira duo is absolutely an amazing find ! Please share with us how you came upon this most unlikely discovery. I for one am very impressed. This area is not very distant from the active RCB star V CrA which I am scheduled to observe soon and I will certainly check VX and VW as well. They have now been noted in my files as 'Karlsson's Twins' ! Thanks again for sharing this unusual case with us. I had a case with two close variables on my images that had the same period in VSX. When I measured them I found that only one of them varied. It turned out that the constant star had been contaminated from its neighbour in SuperWASP, were the information in VSX was taken. I realised that there could be many such cases in VSX and have started examine close variables with similar periods. Until now I have found about 50 faulty variables in VSX that have this error. It was in this work I found this pair of miras were the data in VSX turned out to be correct. Are you planning to publish the results of your research? Astronomers need to know about cross contamination, and the synchronized Miras VX Cha and VW Cha are worth pointing out too. No, I have not published this discovery other than here and on a Swedish astronomy forum. I do not belive that the stars have any physical connection, but this is only a strange coincidence. I investigated all miras in my database of maxima of 499 miras for similar cases and found out that 30 pair of miras have similar "synchronisation". For example have R Peg and R LMi very similar and synchronized lightcurves over the last 20 years. 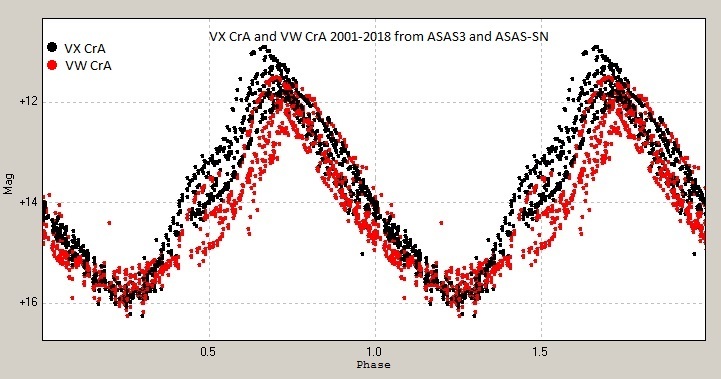 Maybe in the next data release from Gaia we could get information on how close in space VX and VW CrA are. My CCD image taken on 04 Jun 2013 with 85mm lens + ST-10XME CCD in Ic band. VX and VW were easy to separate. Yes, the synchronized light curves are probably just coincidence. If you checked almost 500 Miras, that means over 2000 possible pairs, and most Miras have periods of about a year or so, thus finding 30 pairs that happen to be aligned is not surprising. So yes, it's just chance. But good job on checking. 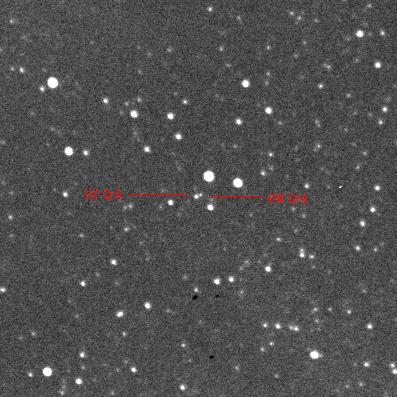 As I tell my non-astronomer pals, "You won't know unless you look, so go look."